With the tens of thousands of scifi titles out there, it gets harder and harder to introduce something new. While this book takes the stranger in a strange land theme to heart (not the Heinlein book, but the general reference), how the author pulls this off was fascinating and clever. We are in a time where we can e-mail photos, and docs, we can even manufacture some things on a printer, so why not the ability to send DNA information across the vast reaches of space to where a clone can then be made? Brilliant! This book worked very well in laying out the story, then following through with all aspects of it. I enjoyed reading the author's take on what would happen to a society when an alien is introduced to that society. And what a society. This new society was essentially herds of alien cows, another new twist to the genre. The author's extrapolation of this society made logical sense to me. It author's choice of cows, even using the word "bovine," is ironic in that this is also a novel on global warming, and on our world, earth cows are a major contributor to greenhouse gases. This had to have been a deliberate choice by the author. 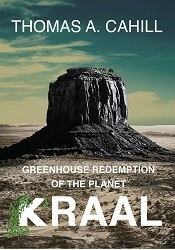 At its heart, this is a novel about environmental catastrophe, but the book does not have to be read only by environmentalists. Even ardent naysayers to global warming can just enjoy the story for what it's worth. This is not a "preachy" novel. The style of the novel is such that it is not a particularly easy read. I fear some people will download the sample, then bog down a bit while reading the first few pages. This would be a shame. I would recommend that potential readers stick with it. The book is well worth it, and before long, the style and flow become familiar, and the reading flows with less effort. This is one of the best scifi novels I have read in quite some time, and I enthusiastically recommend it.